Composer Leonard Bernstein once said, “Music can be the unnamable, and communicate the unknowable.” Both musicians and listeners use music to not only entertain, but also communicate. 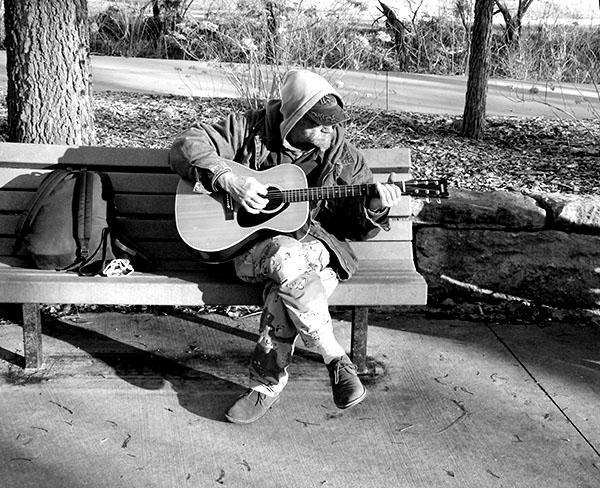 With street musicians, the emotions they carry along with their passion for the art form keeps them playing on benches and sidewalks around the world. This photograph was taken on a sparsely used area of the Missouri Kansas Texas (MKT) trail in downtown Columbia. The lighting from the setting sun with the combination of trees gives the scene a unique play of light and shadow, making the scene seem tranquil. Yet the sharp contrasts also give the scene a harsh, lonely backdrop. The musician in this photograph is fixated on his guitar, even as the sun began to set and several bikers and pedestrians passed by. He never looked up from the instrument as he tried to find the perfect combination of notes to convey his emotions. Music is a language which few can compose, but everyone can understand. Even with no words, music strikes a point with not only listeners but its composers. Composers may confide in music as a writer or painter may confide in their respective art forms. The energy and passion behind this artistry is something to behold; even if no one else is listening, the emotions and passions are still there and have been for thousands of years.